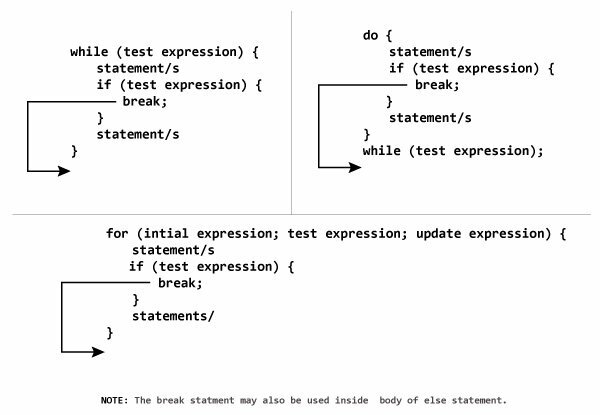 In this article, you'll learn about C++ statements: break and continue. More specifically, what are they, when to use them and how to use them efficiently. In C++, there are two statements break; and continue; specifically to alter the normal flow of a program. Sometimes, it is desirable to skip the execution of a loop for a certain test condition or terminate it immediately without checking the condition. For example: You want to loop through data of all aged people except people aged 65. Or, you want to find the first person aged 20. In scenarios like these, continue; or a break; statement is used. The break; statement terminates a loop (for, while and do..while loop) and a switch statement immediately when it appears. In real practice, break statement is almost always used inside the body of conditional statement (if...else) inside the loop. C++ program to add all number entered by user until user enters 0. In the above program, the test expression is always true. The user is asked to enter a number which is stored in the variable number. If the user enters any number other than 0, the number is added to sum and stored to it. Again, the user is asked to enter another number. 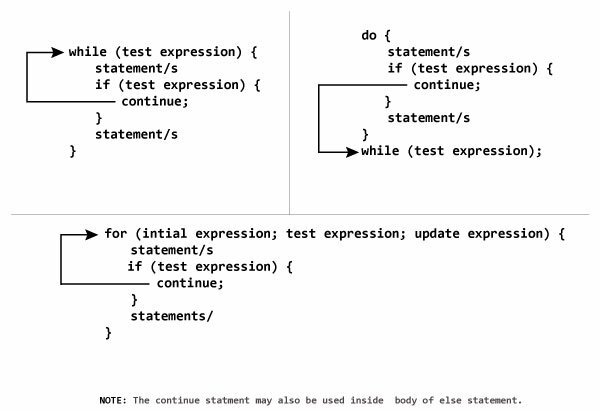 When user enters 0, the test expression inside if statement is false and body of else is executed which terminates the loop. Finally, the sum is displayed. It is sometimes necessary to skip a certain test condition within a loop. In such case, continue; statement is used in C++ programming. In practice, continue; statement is almost always used inside a conditional statement. C++ program to display integer from 1 to 10 except 6 and 9. In above program, when i is 6 or 9, execution of statement cout << i << "\t"; is skipped inside the loop using continue; statement.